I remember when this book was first released, I looked at it was intrigued but ultimately didn’t buy it. Why? I would not be able to tell you now as it fits in what I like to read about. A smidge of mystery, thieves, magic and multiple worlds. I’ll simply chalk it down to being enamoured with something else – easily distracted I can be when it comes to choosing books. Roll around to 2018 and when encountered with a wee trip to Edinburgh I faced the dilemma of what books to read while away, and so as I came across this series again the books were bought and the reading began. It is always difficult starting a series as hyped as Shades of Magic. You have such expectations but like with all books, it is down to the individual view on the writing, the plot and story. As an author, Schwab‘s tagline is ‘for those who dream of stranger worlds’ and stranger worlds is exactly what she delivers as the London’s we are met with are not quite the London’s we know. There is a magic in the world but it does not come equally. There is a world with lots of users, and one with none. There is a world no longer travelled – this is Black London and will have a bearing on the plot. Red London sits in the middle where Kell lives with the royal family traversing between Grey and White London delivering messages. Kell has an idealistic nature but isn’t at all naive to how easy life is, however he isn’t hardened by the world around him as is his White London counterpart – Holland. Holland is stoic, hardened and forthright. His life isn’t easy and the little snippets which are revealed of his life leave the reader intrigued as to why he is the way he is and why his London (White) is so volatile. Delilah comes from Grey London – unsurprisingly it is devoid of magic – and she is a thief who meets Kell after picking his pocket and he hunts her down to collect. Delilah as a character is difficult to like initially, she is nasty and dirty and will do whatever she has to survive. They eventually travel together to Red London – where Kell and Delilah’s personalities balance each other well, her grittiness merges well with his more straightforward approach and they are able to bounce off each other well. 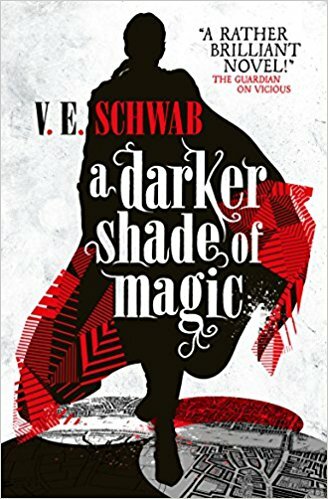 All the characters introduced by Schwab have a purpose, they are not merely included as cannon-fodder but instead used to build the main protagonists stories. There is no needless romance just because the author/editor/publisher wants to tick that box, the best friend – Rhys acts as a centre to Kell and keeps him grounded. The plot progress’s at a pleasant snappy pace although some of the plot points come across as somewhat predictable I couldn’t help but think I was reading something that would actually have a much larger bearing later in the series. Overall, I really enjoyed this book and series as a whole. The writing is engaging and witty, the story isn’t overly confusing and the multiple point-of-views allow for an easy progression and a time for getting to know the characters before they come together. This is later books can lead to a bit of confusion as the amount of characters that are followed increases but ultimately it is the ideal writing technique for this story. Besides, we all would love Kell’s multi-sided coat.